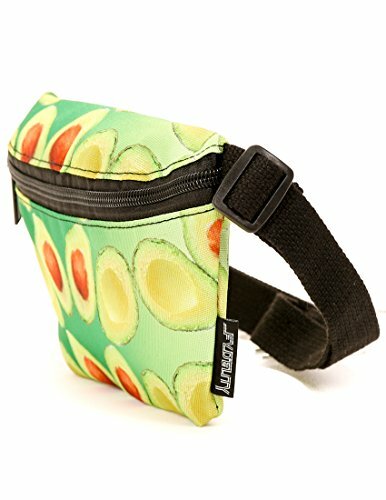 Head to the local organic co-op thrift store farmers market with the FYDELITY Avocado Print fanny pack. It will not brown after opening. Battle the bulge, FYDELITY's hip sacks are not your granny's fanny's. Accessorize any outfit with a FYDELITY bum bag without the belly bump. Our waist bags sleek lines won't distract from your style and they can be discreetly worn day or night. Try them on your bum, belly, hip, cross body or over the shoulder. With more than 100+ designs to choose from your can wear them loud and proud or neat and discreet. Low profile, FYDELITY fanny packs fit just the right amount of gear to keep your hands free and your gear under wrap. They'll fit on your bum, your belly, your hip or over the shoulder without that horrible bulge. Plenty of space for your phones, keys, cash, ID wallets, sunglasses, lip balm, concert tickets, back stage passes, etc. Wear the FYDELITY fanny pack to work, for an evening out, to music festivals, dance parties, raves, disco's, night clubs, walking your dog, the beach, the pool, on spring break , tailgating, sleep away camp and to the gym. FYDELITY Fanny Packs are the solution for big phones and tight jeans. Makes a great gift for travellers. FYDELITY fanny packs measure 9" x 5.5" x 1" (24cm x 14cm x 3cm). The BELT STRAP LENGTH adjusts from 28" to 44" (70cm to 111cm) and an optional 12" extender is available for additional purchase. FYDELITY uses the best possible materials & construction techniques. All seams are double stitched and our belt straps use a cotton blend this is super strong while being soft to the touch and won't irritate your skin. If you have any questions about this product by Fydelity, contact us by completing and submitting the form below. If you are looking for a specif part number, please include it with your message.